Even before zebra and quagga mussels arrived in the Great Lakes in the 1980s, the future looked a little bleak for native mussels. The invaders came close to wiping them out entirely. But small populations in Lake Erie appear to not only be surviving the invasion, but thriving. Average density of native mussels before the arrival of zebra mussels was two per square meter in Lake St. Clair. By 1990, zebra mussel density was at 1,600 per square meter. “By 1992, native mussel populations are almost gone from the southeastern portion of the lake and declining rapidly in the northwestern portion of the lake,” said [Dave] Zanatta, [a biologist at Central Michigan University]. By 1994, there were almost no native mussels left in the lake, with zebra now at 3,000+ per square meter. More recent research funded through the Great Lakes Restoration Initiative also reveals that native mussels have maintained genetic diversity, a key to any species’ long-term survival. Zanatta’s research adds further evidence that progress continues to be made on one of the impairments of the St. Clair River – the degradation of fish and wildlife habitat – that led to its classification as an environmental Area of Concern in 1985. His work also sheds light on the complex ecological impacts of invasive species generally. With some environmental observers predicting a doomsday scenario for native game fish if Asian carp are able to establish themselves in the Great Lakes, for example, Zanatta’s mussel research suggests that the outlook for native fish might be significantly more positive than forecasts suggest. 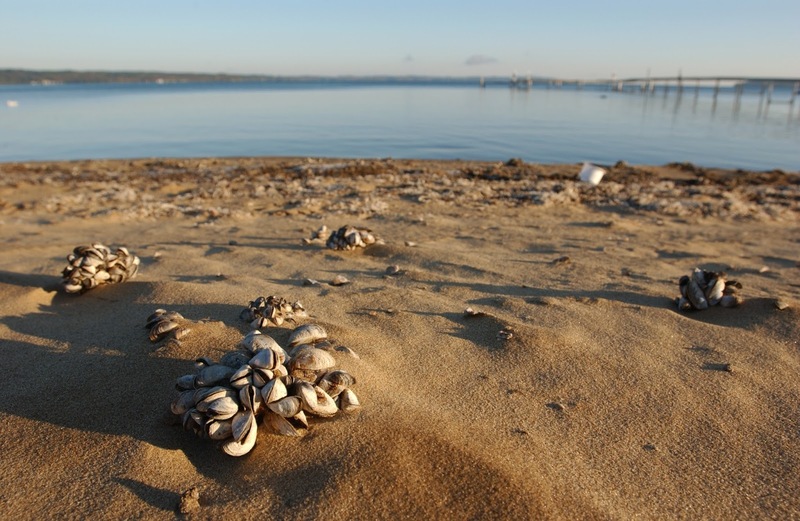 **Photo of zebra mussels courtesy of Michigan Sea Grant.